Tickets on sale now at rivercityrockfest.com! Bud Light River City Rockfest returns for its sixth year with a massive rock lineup Saturday, September 22 at The AT&T Center Grounds in San Antonio, Texas. South Texas’ only rock festival will feature a headlining performance from Nine Inch Nails, and will also feature Primus, Stone Temple Pilots, Bush, Chevelle, Joan Jett & The Blackhearts, Clutch, All That Remains, Suicidal Tendencies, and many more on three stages. 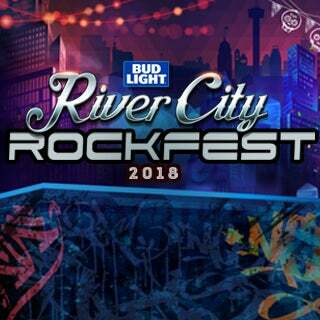 The full music lineup for the Bud Light River City Rockfest includes: Nine Inch Nails, Primus, Stone Temple Pilots, Bush, Chevelle, Joan Jett & The Blackhearts, Clutch, All The Remains, Yelawolf, Suicidal Tendencies, The Sword, Drowning Pool, The Fever 333, Upon A Burning Body, Tyler Bryant & The Shakedown, I See Stars, Demob Happy, The Heroine, Blacktop Mojo, Lynnwood King & The Revival and Covina. Ticket prices are as follows. Fans are encouraged to buy now and save.